Jackatalla is situated in the Nilgiri Hills in the south of India, one thousand feet below Ootacamund and only eleven degrees from the Equator. In 1843 a British Regiment was installed here by Marquis Tweedale and four years later an officer’s training college was established in order to acclimatise new recruits for the Madras Regiment. 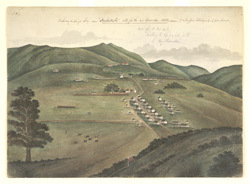 The town was renamed Wellington after the famous Duke in 1854 and the barracks became the head quarters of the Southern Brigade of the 9th Secunderabad Division. The town quickly developed into the principal military sanatorium of the British Army in south India.